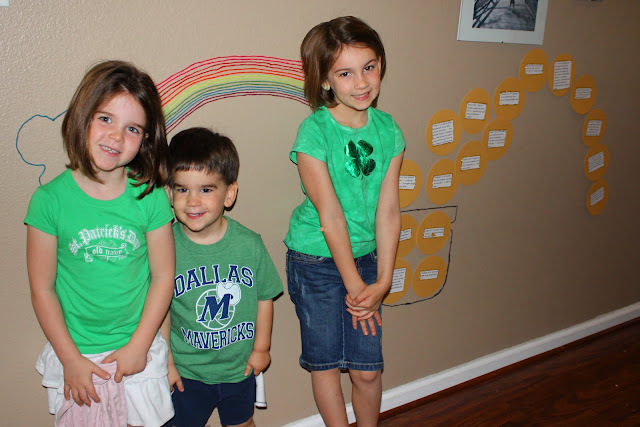 Ella, Asher, and Rilyn wearing their green! If you have no clue what is going on behind the kids, click here. When we left your house the other day, the girls asked me why we didn’t ever decorate for St Patrick’s Day. “Maybe next year” is what I told them – now I’ll try to make it to Hobby Lobby and find some great sale items for next March. You sure set the bar high for holiday fun and decor 🙂 I always love seeing what is going on at your household!